When I got married in October 2014, I hadn’t been dreaming about my perfect dress and the perfect venue and the perfect flowers since I was old enough to read a women’s magazine, but it was still the perfect day. My now-husband and I paid for the wedding ourselves; we opted to splurge on a honeymoon in Vietnam and save our pennies on the actual wedding day. We used tech tools to help keep our costs down and spent a grand total of $7,000. Compared to the average U.S. wedding cost of $31,213, according to The Knot, we saved a ton of money. Here’s how we planned our wedding on a budget. My husband and I wanted a backyard wedding, but our San Francisco yard was too small. We could have rented a park, but city regulations meant we couldn’t play amplified music and would have to leave by 4 p.m.
As longtime Airbnb users, we figured we might be able to rent a house with a yard. A quick search showed us there were not only plenty of options, but many were within a short walk of our house. To find available properties, we used the keyword “backyard” and clicked the option “suitable for events” under the “more filters” option. You can also input the maximum number of guests (16+), which will show you a ton of results that advertise as event space, for as low as $500 per weekend. We connected with a lovely property manager whose house was only two blocks from our apartment. He was more than happy to let us get married there and even let us set up a few days early (though we threw him an extra $400 as a thank-you). For $1,000 total, we got a two-bedroom apartment with a giant backyard. As an added bonus, we earned some of that money back by housing a few guests there! We spent an extra $250 on a gardener to clear leaves and plant fresh flowers beforehand. Our host was more than happy to let us beautify his yard. Our afternoon barbecue wasn’t a dance party, so we decided not to drop the money on a professional DJ with expensive equipment. We already owned two great-quality bluetooth speakers, so we just used our monthly Spotify subscription for our background music. We let our friends play DJ and ended up listening to everything from Taylor Swift to Nat King Cole. Since our wedding was so small, it didn’t make sense to spring for fancy invitations. Instead, we hunted around for a service that would send the invites, power our wedding website and manage the RSVPs. There are tons of platforms that do each of these things individually, but Glö was the only one to do all of the above. I found The Perfect Dress a few months into our engagement at a fancy boutique, but I couldn’t bring myself to spend $1,300 (plus extensive alterations) for a dress I would wear only once. So I set up a Google Alert for the name and brand of dress. A few months later I got a result from OnceWed — part wedding blog, part used-dress classifieds — where I found my exact dress, worn once, never altered and in my size for only $500. I ended up talking to the seller on the phone, and we became fast Facebook friends. I love that I got to hear her wedding story, then make her dress my own. I hired a tailor on Thumbtack to add sleeves and shorten the train for an extra $300. Feeding 40 people was surprisingly easy: We just ordered takeout! We called our favorite San Francisco restaurant a few days before the wedding to give the staff a heads-up, and the total cost was just under $500. The restaurant doesn’t deliver, so we hired a TaskRabbit to pick up and deliver the food to our Airbnb for an extra $30. He showed up right on time (with his mom to help! ), and they walked in smiling, showering us with congratulations. Also, the food was phenomenal. I’m blessed with a plethora of crafty friends, an addiction to Pinterest and an appreciation for outdoor beauty. We didn’t do a ton decor-wise since the flowers and trees were plenty, but we did order a bunch of Mason jars, tissue pompoms, ribbon and chalkboards on Amazon for just under $70. One epic craft night later, we had all our decorations ready. The day before the wedding, I stopped by our local flower stand and bought a bunch of flowers in matching hues. It cost another $70 (this included my bouquet! ), and we did some quick arranging in the previously mentioned Mason jars. An artist friend led the charge the morning of the wedding to make sure everything was set up and gorgeous. After the official ceremony and reception, we hosted a karaoke after-party where we sang our faces off. It’s San Francisco, though and parking wasn’t an option. Instead of taking the bus, we used Sidecar, a ride-sharing app. Sure, we could have rented something fancier, but it was only a 10-minute drive. We even went super stingy and used the “shared rides” option, which could potentially have put us in the car with strangers. We were the only passengers both ways, but our driver was pretty excited to see us in our wedding attire. We ordained my husband’s best friend on the internet through the Universal Life Church. I’d always heard this was a thing, but I had no idea how easy it was. He didn’t even need to be present; we just filled out the form online and entered his address. A few days later, he got a letter saying he was an official minister. If you want a friend to officiate, definitely go this route — but check the rules in your state first. The state of California allows people to get “deputized for a day,” but charges $120. Getting ordained online costs less than $20 and they can perform more ceremonies down the line should they choose. If you go this route, you need to give up a certain idea of how your day will go. We played host instead of being fully pampered, but that type of wedding never appealed to either of us anyway. 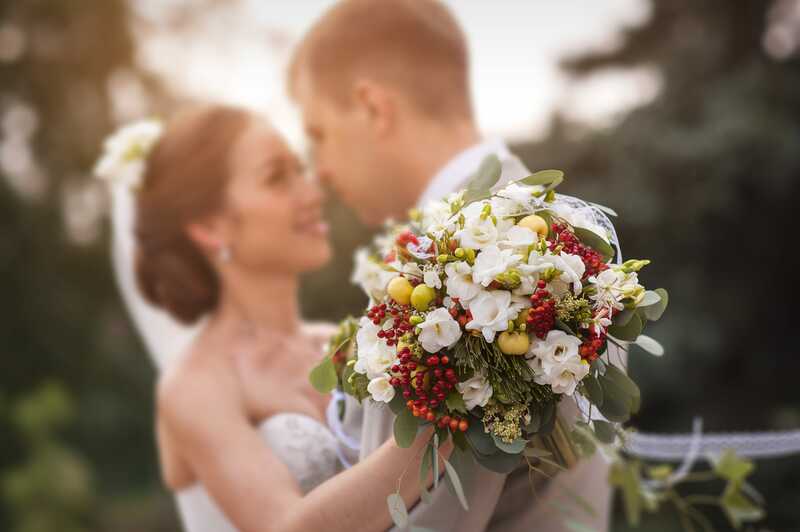 If you’re planning a wedding on a budget, but you’re in the mood for something more traditional, choose some of these areas to save money, then spend your savings on others. The one place we didn’t skimp was on our photographer. I figured I wouldn’t remember our centerpieces or paper plates, but I knew we’d look back on our photographs until we’re old and gray. So we spent $4,400 on the best photographer we could find (that was his cheapest package, and we booked him a year in advance), and I’m so glad we did. The photos are gorgeous. My wedding was the best day of my life. Sure, our decorations were a little wilty, and sometimes there was a lull in the music, but all I remember was joy: The song my best friend wrote for us. My husband’s face as he said his vows. Our friends whistling and cheering as we were pronounced husband and wife. The sinking sun in the garden as Elliot and I held hands and watched the party shimmer around us. Marian Schembari is a writer and blogger based in Düsseldorf, Germany, by way of San Francisco. She writes about travel and creativity and spends way too much time on the internet.